Going into having our second child soon, I figured it'd be nice to share our "must haves" that I found with Viv that we couldn't go without. I see a lot of mom's asking other mom's what were some of your essentials, things you just could not NOT have that were a lifesaver esp during those first few weeks. 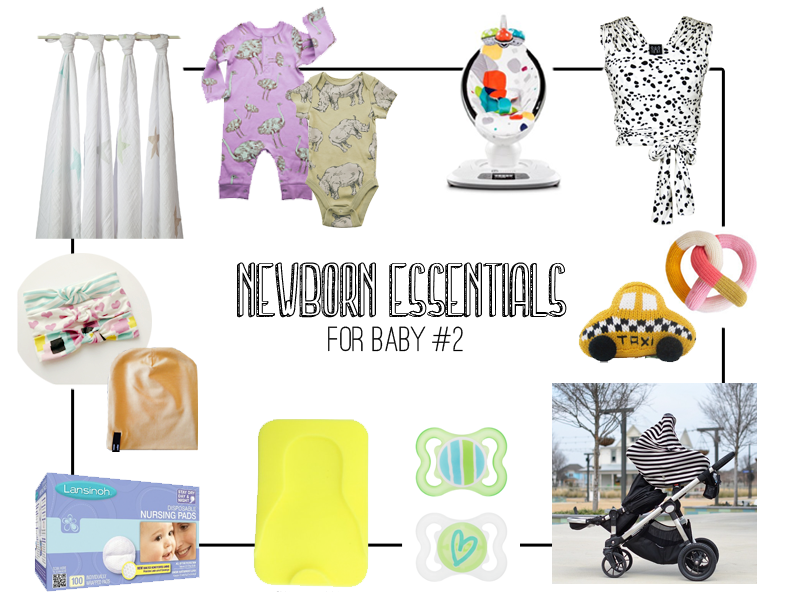 I've narrowed it down the literally the bare essentials other than diapers so I hope this helps! Enjoy! Aden & Anais Swaddle Blankets - I never had these with Vivian, but I did have literally 2 drawers STUFFED with different swaddle blankets and receiving blankets that more than half of were never used. I love these because they can be a swaddle blanket, car seat cover, or just a regular blanket. Love having options and the versatility that goes with these! Laniosh Nursing Pads - This one isn't necessarily something for baby but was AMAZING for me with V. I stopped breastfeeding her at 1 year so me and these nursing pads were BFF's for a while. I've also tried the reusable ones that you can throw in the washer, but to be honest they're kind of gross and I'd just rather use and toss. Modern Wrap Carrier - This is a new one for me because we used the Boba with V and it was magical. Literally a life saver so I can only imagine with two babes how helpful a carrier will be the second time around. First I love this print, and I love that it's a softer material too. Plus, there's many different options to choose from! Beau Hudson Newborn Beanie - Since we won't be doubling up on headbands, I've also discovered a love for beanies for Finn I want to stock up on! I'm obsessed with all the colors and patterns, and also love them from Lemons & Lace as well. House of Mia Headbands - Viv has plenty of headbands, and House of Mia has always been one of my favorites as far as prints go so I'm not sure why we don't own any, haha. BUT I know girls can never have enough headbands, esp when they're new to the world there's just something so sweet about a soft printed turban on an itty bitty newborn. Pristine. Rattle Toy - This is also kind of a given. I mean we all know about Sophie the Giraffe which was a favorite around here, but I just love these soft knitted rattles for the babes. They're colorful, intriguing, & plush. You can find the pretzel here & taxi here. 4Moms Mamaroo - This is something we didn't have for Viv either, but we just recently got for Finn and it's supreme. I know how raved about it is, and there's many reasons. We had a Fisher Price one for Vivian that broke literally days after she was born and so I'm really excited about this for Finn because V loved her swing! Bath Sponge - Another lifesaver for us. Luckily Viv was always a water baby and loved baths, but I swear this helped in that department. We used it with the Primo Euro Bath and it just keeps them from slipping and keeps them nice & warm. MAM Pacifiers - You know those wubanub pacifiers with the animals attached to it? Viv HATED hers and it never got used. I love these MAM ones because they're BPA free & have air holes so they're skin won't get irritated. Baby Jogger City Select - Okay. This bad boy. We've been through several strollers and finally hit the jackpot. This stroller is on the pricey side, but it is worth every. single. penny. Viv absolutely loves this stroller and will crawl in it on her own and let us know it's time to stroll the queen around, haha. It can be turned into a double stroller and has many facing options between the seats. You have the option of using your car seat in place of the second seat as well. I wish we'd known about this the first time around, but I've learned the first baby is always trial and error as far as products go! Covered Goods Multi Use Nursing Cover - I discovered this little gem through Instagram. It can be used as a nursing cover (front AND back) which I love! I had one with V that only covered the front and I remember being in the airport and continually telling Chase I felt exposed so I love having that comfort of knowing you're all good. It also can be used as a car seat cover, score! We always used just a blanket which was not working in our favor, esp when the wind would blow. First time mom problems. What were/are your must haves? !